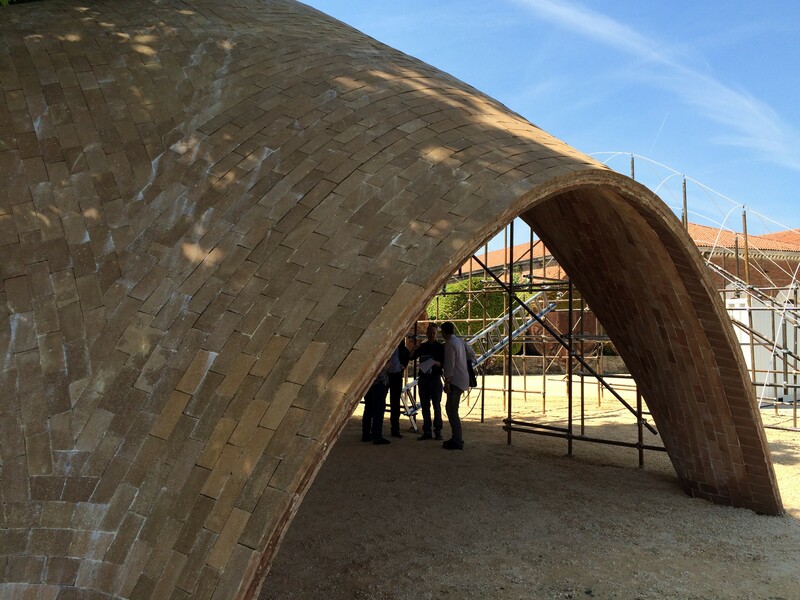 The “Droneport” vault construction at the Norman Foster Foundation Pavilion using “Durabric” compressed earth tiles developed by LafargeHolcim. 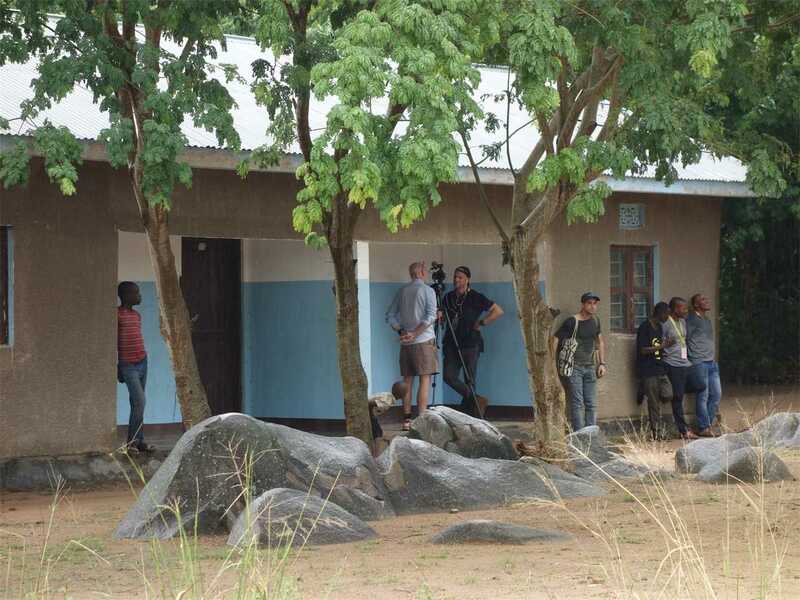 The network aims to interconnect communities in developing countries that lack appropriate road or rail networks, enabling urgent medical supplies and cargo to be delivered quickly and cost-effectively. 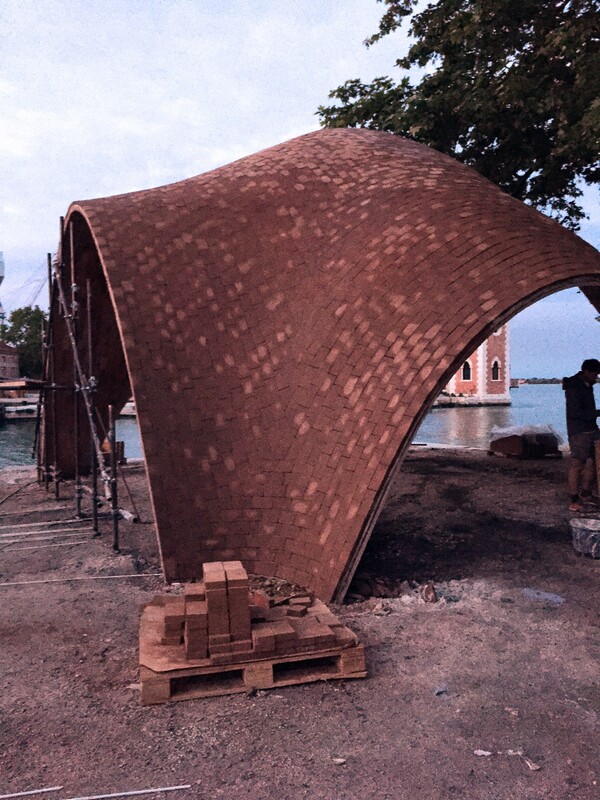 The “Droneport” vault construction at the Norman Foster Foundation Pavilion using “Durabric” compressed earth tiles developed by LafargeHolcim a few days prior to the opening of the 15th International Architecture Biennale in Venice. 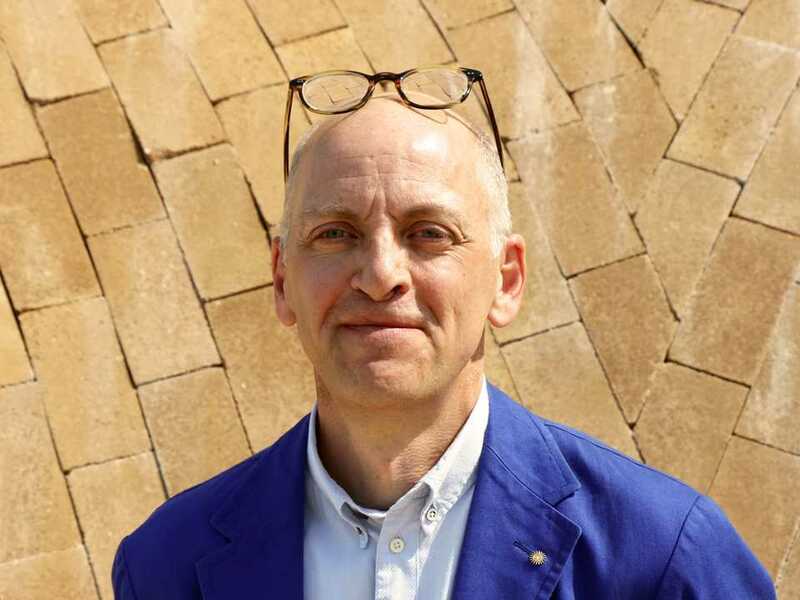 “The Droneport project is about doing more with less, capitalising on the recent advancements in drone technology – something that is usually associated with war and hostilities – to make an immediate life-saving impact in Africa.” – Norman Foster. 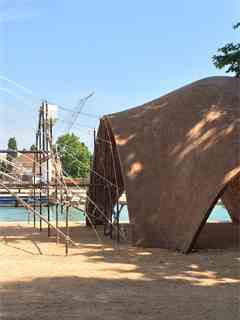 The construction of the prototype Droneport shell has been made possible by The Norman Foster Foundation together with engineering skills from ETH Zurich, Massachusetts Institute of Technology, Cambridge University; contributions by students from Madrid, ETH Zurich and MIT; and the support of the LafargeHolcim Foundation for Sustainable Construction and the LafargeHolcim Research Center in Lyon. They have produced a high strength, earth-based Durabric product specifically for the project. 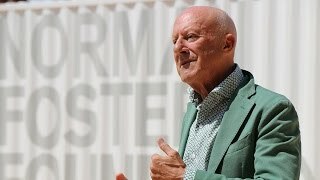 Norman Foster, Founder and Chairman of Foster + Partners; and Chairman of the Norman Foster Foundation, has unveiled the first full-scale prototype of his Droneport concept at the Arsenale, which is designed to transport medical supplies to remote regions in Africa using unmanned flying vehicles. Jonathan Ledgard, Director, Afrotech & Future Africa, Swiss Federal Institute of Technology (EPFL). The concept branded as “Redline”, was incubated within EPFL Lausanne under his leadership. “Redline’s” intention is to build three “Droneports” as proof of concept on land offered by the Rwandan Government on long-term leases. 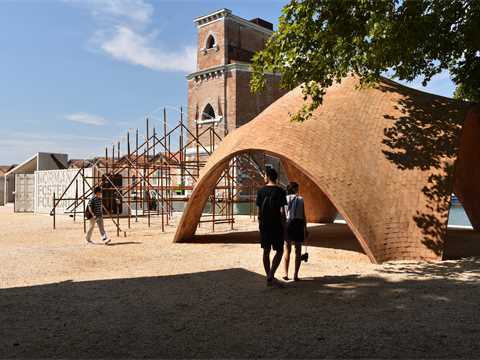 To demonstrate concept feasibility and raise the public profile of the Droneport venture, a pavilion based on a prototype vault has been erected as part of the 2016 Venice Architecture Biennale. 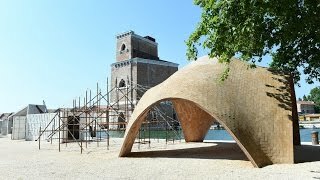 18,000 Durabrics were made available for the Droneport construction in Venice. As the technology is easily transferable, the LafargeHolcim Foundation for Sustainable Construction encouraged the use of Durabric to build the Droneport prototype at the Architecture Biennale in Venice as a symbol for future projects in Rwanda and other emerging countries. The drone is capable of delivering cargo quickly and cheaply on continents lacking adequate road and railway systems. A proposed drone network would bypass these deficiencies. 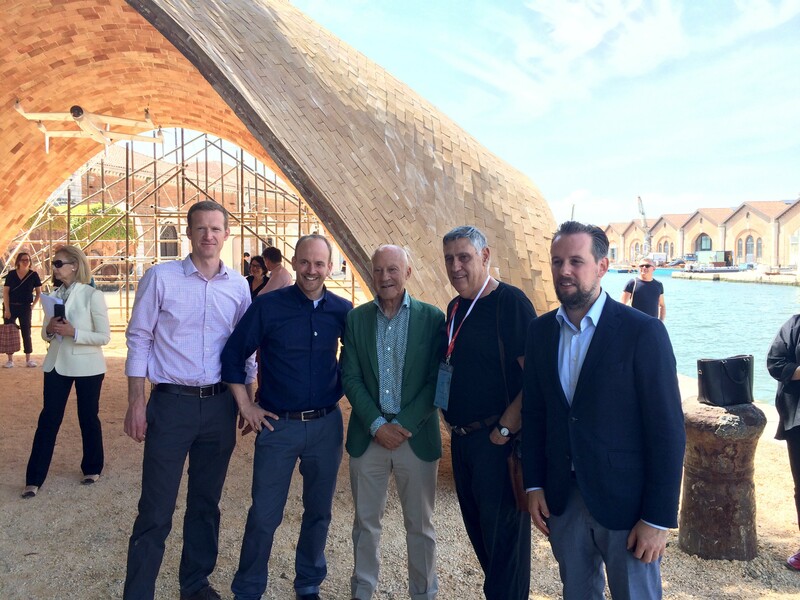 Celebrating the completed "Droneport" prototype - a result of teamwork across disciplines and continents (from left): Matthew DeJong, ODB Structural Engineering, UK; John Ochsendorf, ODB, USA; Lord Norman Foster, UK; ​Peter Rich, South Africa; Philippe Block, ODB/Block Research Group, Switzerland. Personal engagement of Lord Norman Foster: proposals to further optimize the “Droneport” prototype vault at the 15th International Architecture Biennale in Venice which has been constructed using customized “Durabric” compressed earth tiles developed by LafargeHolcim. 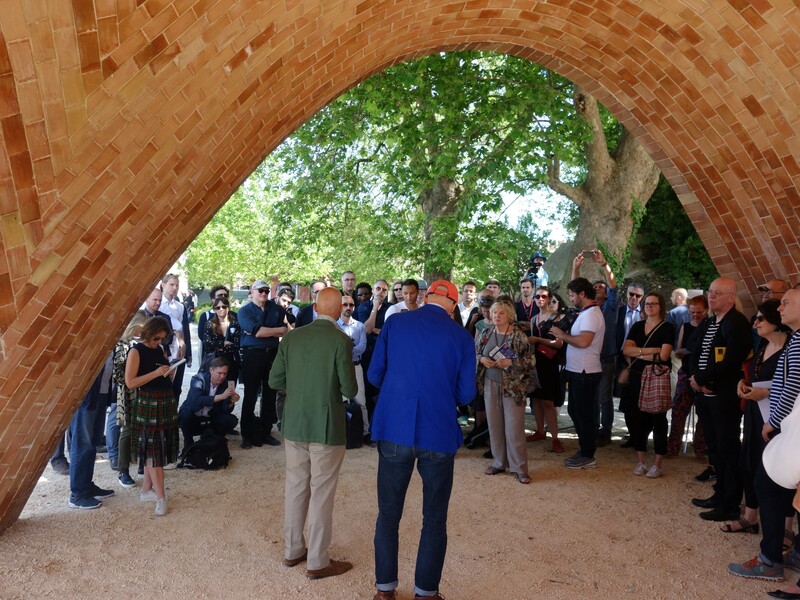 The LafargeHolcim Research Center in Lyon delivered 18,000 customized “Durabric” compressed earth tiles to construct the “Droneport” prototype vault at the Norman Foster Foundation Pavilion as contribution to the 15th International Architecture Biennale in Venice. 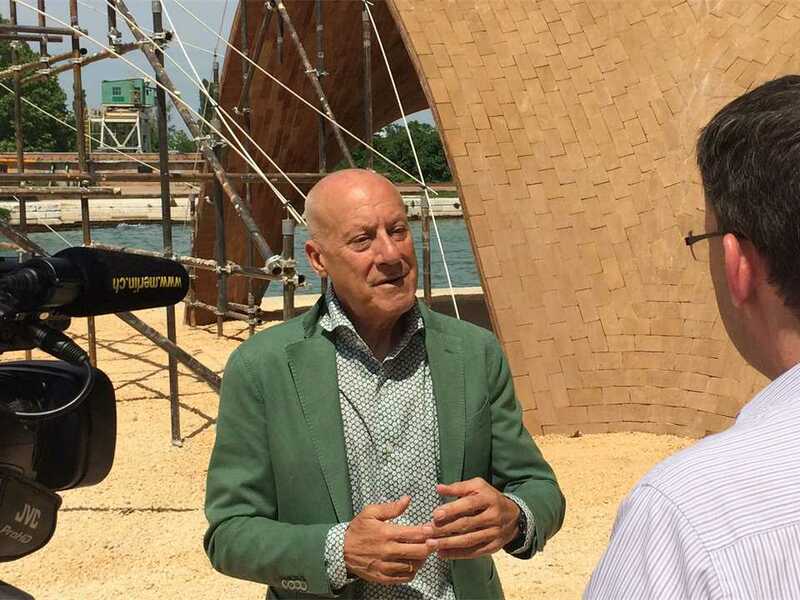 Testing on site: Lord Norman Foster approving a construction sample of “Durabric” compressed earth bricks at his “Droneport” pavilion at the 15th International Architecture Biennale in Venice. Collaborating on the project, John Ochsendorf (right), of Ochsendorf, Dejong & Block (USA). 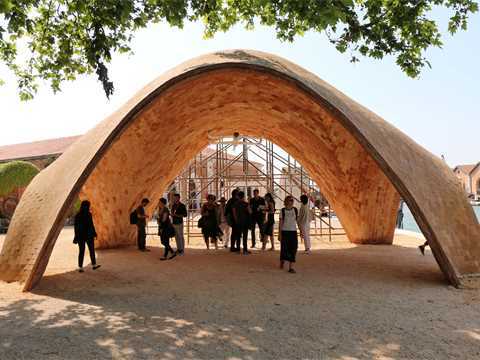 The prototype presented at the Venice Biennale is a first iteration to define the key architectural elements of such a building. As a tile vault with a robust structural form and simple, foolproof formwork system, it is inexpensive to construct. 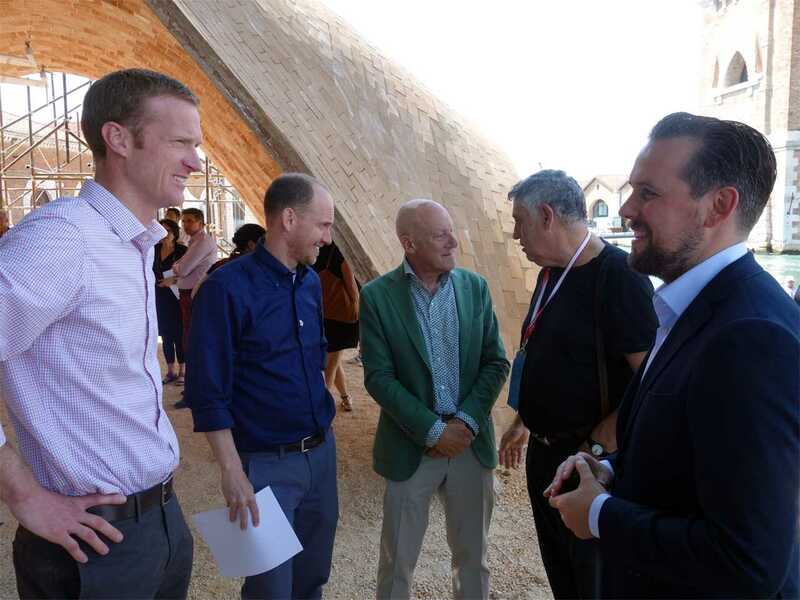 Werner Sobek (center), Director of the Institute for Lightweight Structures and Conceptual Design (ILEK), University of Stuttgart in Germany, and a member of the Global Awards jury in 2012 visits the Droneport pavilion. The prototype vault comprises two outer layers of this custom Durabric with an inner layer of traditional tiles. 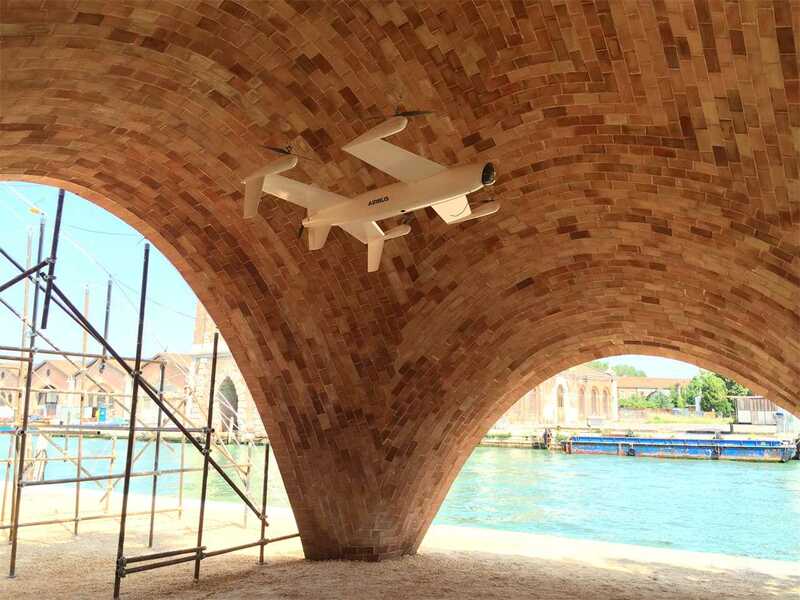 The Droneport’s location at the end of the Arsenale in Venice is symbolic as the gateway to a newly opened public park. The possibility of the structure remaining as a permanent legacy is now under consideration. Collaborating on the project, John Ochsendorf (left), of Ochsendorf, Dejong & Block (USA). The proposal for a Droneport is expected to provide one step towards development; using the air to move things on a small scale may be a shortcut that will ultimately save time and money without having to wait for heavy, conventional infrastructure. 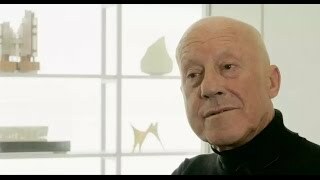 Norman Foster combines state-of-the-art engineering that can be built by almost everybody. He actually involved students in the construction, not as a pedagogical or academic statement but as a way to test the proposal’s transferability. The special Durabric product of stabilised earth is a reliable, affordable and environmentally friendly building material that does not require intensive use of fuel to achieve its performance. The Droneport supports cargo drone routes capable of delivering urgent and precious supplies to remote areas on a massive scale. Cargo drone routes have utility wherever there is a lack of roads, and transcend geographical barriers such as mountains, lakes, and unnavigable rivers without the need for large-scale physical infrastructure. The project offers an “infrastructural leap” using drone technology and clean energy systems to surmount the challenges of the future. Led by Jonathan Ledgard (pointing to map) and Aerial Futures, possible blueprints for functional, sustainable and scalable Droneport infrastructure hubs are being designed. 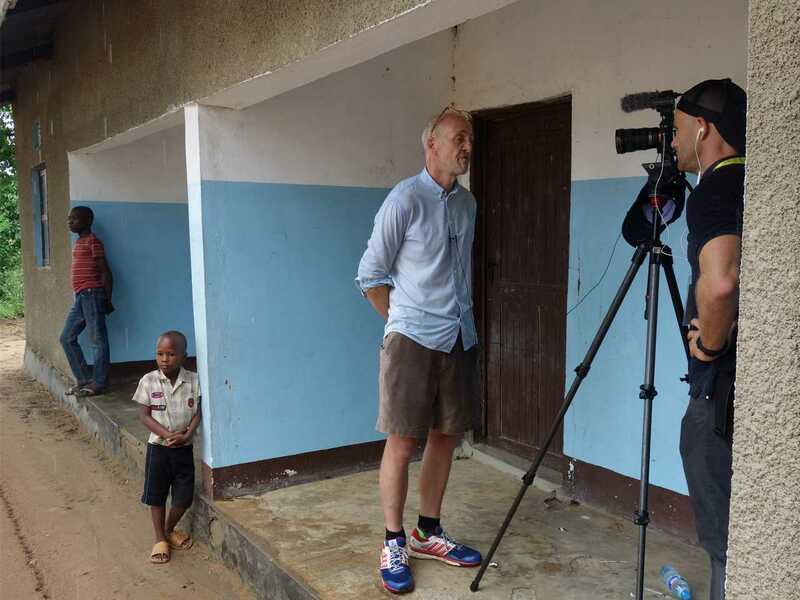 Jonathan Ledgard (being interviewed) is convinced that Africa will pioneer the fourth industrial revolution by making use of digital fabrication and robotics in daily applications. Probably the first TV-interview on Juma Island: Jonathan Ledgard in the entrance of the schoolmaster’s house. Jonathan Ledgard (pointing to map) is at the heart of the Droneport concept that enables rapid development in rural areas of Africa where traditional means of transport are challenging, frequently time-consuming and sometimes dangerous. 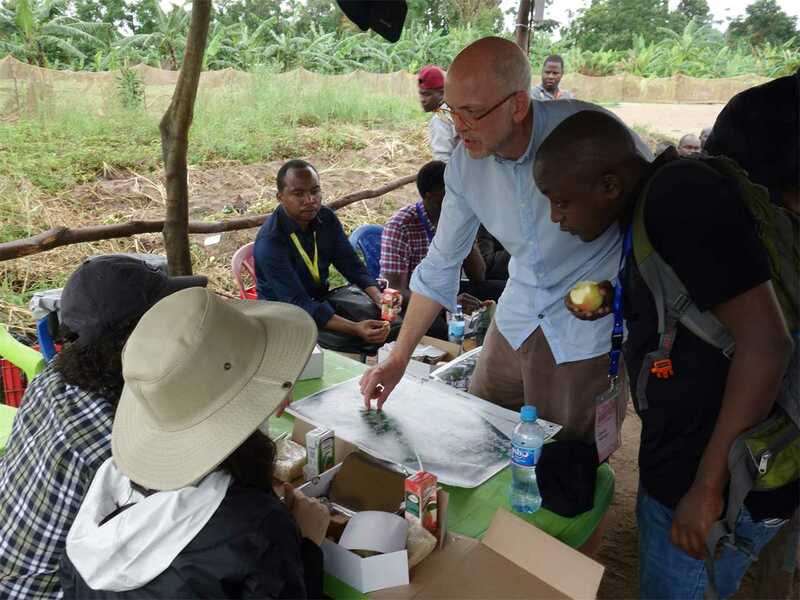 The Lake Victoria Challenge (LVC) held in Mwanza, Tanzania is the first-ever international symposium on drones and their possibilities in Africa. The World Bank estimates the global demand for drone infrastructure to surpass USD 130 billion in the near future confirmed Bella Bird, World Bank Director for Eastern Africa. 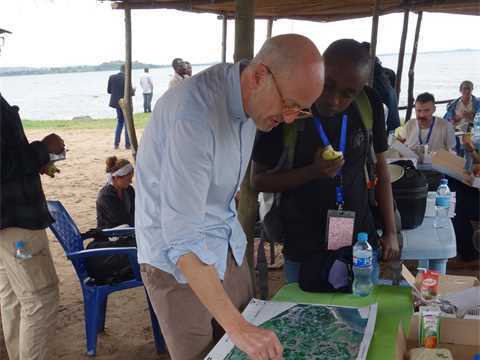 The LCV was held in Tanzania’s second largest city on the shore of Lake Victoria, where the opportunities for development that leapfrogs the need for physical infrastructure were abundant and compelling. Sustainability – and especially sustainable construction – is at the heart of the Droneport concept that enables rapid development in rural areas of Africa where traditional means of transport are challenging, frequently time-consuming and sometimes dangerous. Durabric and other locally-produced building materials of LafargeHolcim and 14Trees are well suited to meet the demands of the infrastructure hubs for drones (Droneports) to be constructed in Eastern Africa and beyond. 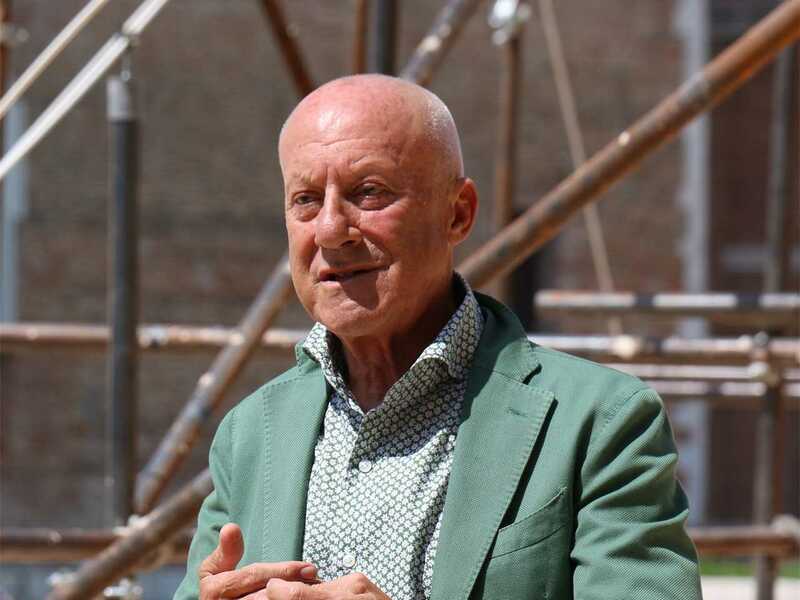 Architecture icon Lord Norman Foster and leading thinker on emerging economies Jonathan Ledgard initiated the Droneport project with the idea to build modular ports that would serve as a base for drones responsible for delivering cargo and medical supplies quickly and cost effectively, in particular for communities in Africa. The hubs to receive the drones in remote areas are not single Droneports, but describe a network of focal points to be developed alongside the introduction of unmanned air-borne transportation. The hubs must include means to produce solar electric power, which is needed to charge the batteries of the drones, and could enable additional innovative approaches such as digital manufacturing labs as well as services enabling further development such as lighting, shelter, public spaces, sanitation facilities, medical care centers, repair workshops, and market spaces. The hubs are to be built with locally available materials by locally-trained artisans and have the lowest possible carbon footprint over their lifetime. Led by Jonathan Ledgard and Aerial Futures, possible blueprints for functional, sustainable and scalable modular Droneport infrastructure hubs are being designed. The first hubs are to be built for a drone connection between Mwanza and Juma Island in Lake Victoria to coincide with the next Lake Victoria Challenge (LCV) in mid-2019. The island’s 10,000 inhabitants are currently separated from services on the mainland by a boat trip of several hours using the simple vessels available. The island’s subsistence income is generated by selling the daily fish catch to brokers who then sell to the markets in the city. In parallel, the outcome of the working groups on drone technology, regulations, and flight control are being prepared for this symposium which will be enabled by the World Bank and supported by numerous international governmental and non-governmental organizations, and local authorities. By enabling a drone infrastructure, the lower skies are unlocked as a resource for mobility and development, and offer ample opportunities for future-driven infrastructure projects to be realized in Africa. Lord Norman Foster will be a keynote speaker at the 6th International LafargeHolcim Forum to be held in Cairo, Egypt in April, 2019. Keynote speeches, workshop presentations, topical excursions in the vicinity of Cairo and discussion sessions in plenary or workshop groups will focus on strategies to “re-materialize” construction by reducing consumption throughout the material cycle from extraction to processing, transport, installation, maintenance, and removal – contributing to a leaner industry: one with a smaller ecological footprint and not driven by the long-standing pretense of infinitely available raw materials. The impressive vaulted Droneport prototype of low-carbon compressed earth and cement Durabric developed by LafargeHolcim is still welcoming visitors at the north entrance to the Arsenale in Venice. The challenge was to ensure a compressive strength of at least 10MPa whilst minimizing the weight and thickness of each tile. Architecture icon Lord Norman Foster and leading thinker on emerging economies Jonathan Ledgard initiated the Droneport project with the idea to build modular ports that would serve as a base for drones responsible for delivering cargo and medical supplies quickly and cost effectively. 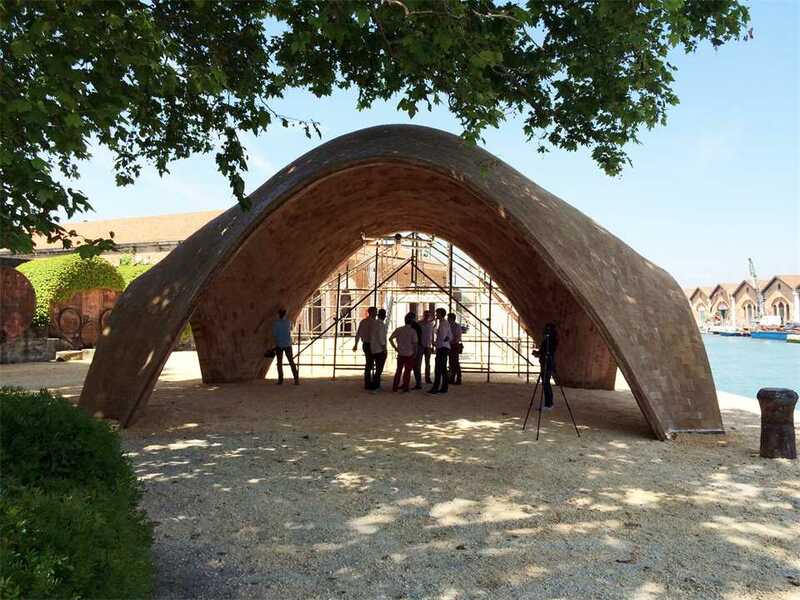 Although initially developed as a solution for the Droneport, the construction system is applicable to a wider range of needs such as markets, schools and medical facilities. Using ancient building techniques and innovative materials, the lightweight compressed earth tiles developed by LafargeHolcim’s Global Research & Development Centre (LCR) in Lyon are standing the test of time and performing well against structural pressure as well as weather exposure. 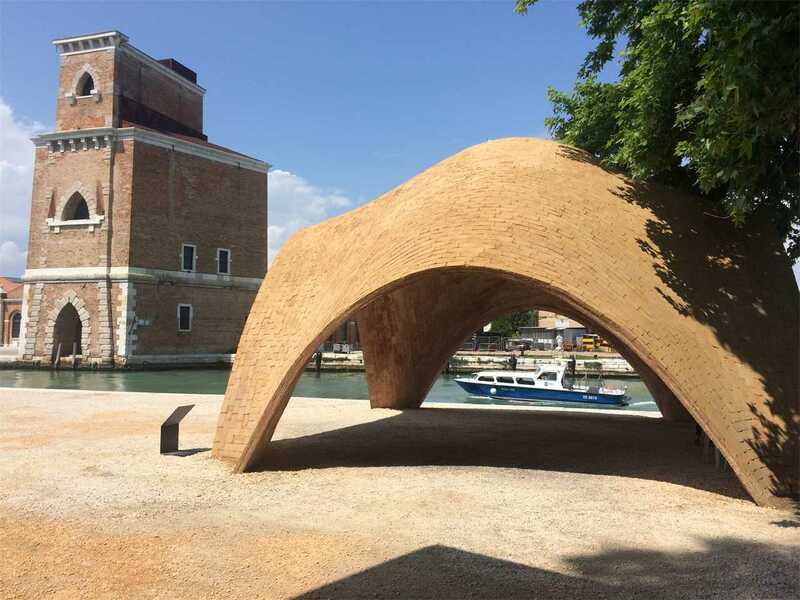 The impressive vaulted Droneport prototype of low-carbon compressed earth and cement Durabric developed by LafargeHolcim is still welcoming visitors at the north entrance to the Arsenale in Venice. Created for the 2016 Architecture Biennale, the structure is symbolic as a gateway to the world’s most significant architecture exhibition. 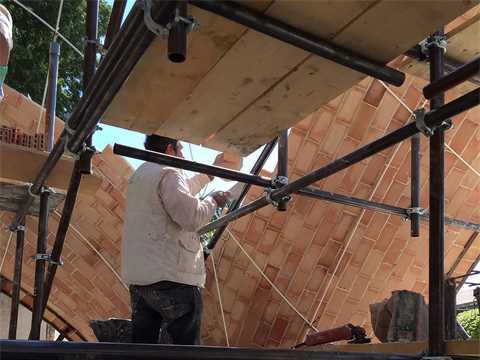 Using ancient building techniques and innovative materials, the lightweight compressed earth tiles developed by LafargeHolcim’s Global Research & Development Centre (LCR) in Lyon are standing the test of time and performing well against structural pressure as well as weather exposure. 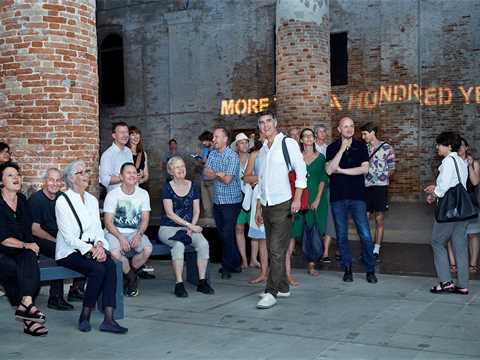 The prototype for enriching civic infrastructure by leveraging new technology is perfectly aligned with the theme of this year’s Biennale, “Freespace” – which describes a generosity of spirit and a sense of humanity at the core of architecture’s agenda. 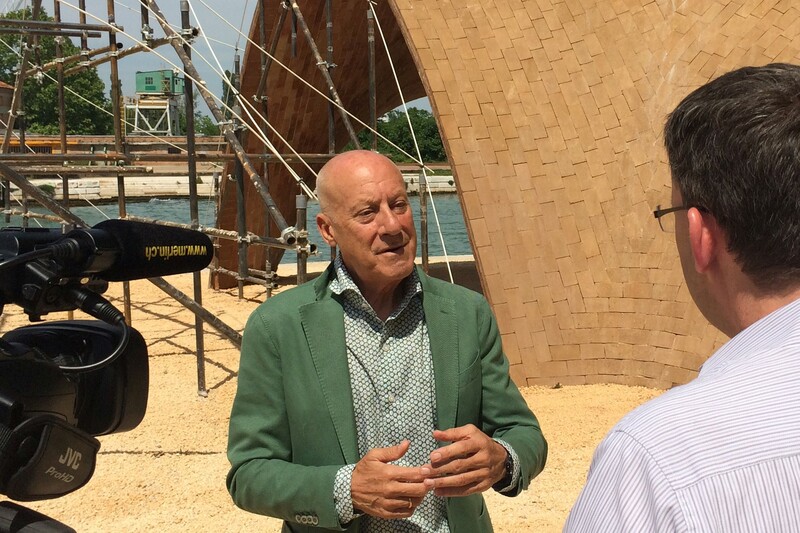 Architecture icon Lord Norman Foster and leading thinker on emerging economies Jonathan Ledgard initiated the Droneport project with the idea to build modular ports that would serve as a base for drones responsible for delivering cargo and medical supplies quickly and cost effectively, in particular for communities in Africa. The LafargeHolcim Foundation for Sustainable Construction acted as a turntable for the collaboration needed to develop bricks to meet the specific requirements, and sponsored the production of 18,000 customized bricks as well as the structural design and the construction of the vault. 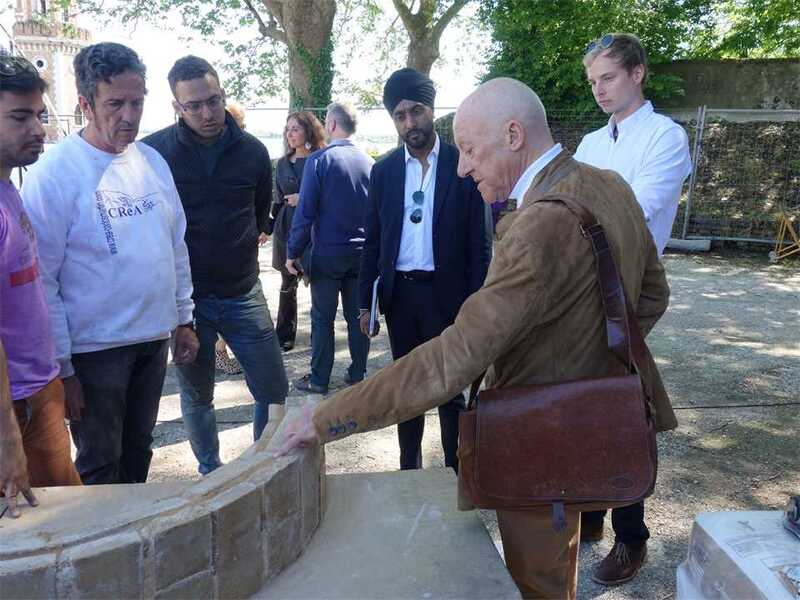 The project brought together professors and students from five universities across Europe and the USA to develop the composition and fabrication of the compressed earth bricks with LafargeHolcim’s LCR. The challenge was to ensure a compressive strength of at least 10MPa whilst minimizing the weight and thickness of each tile. Bricks up to task of creating the self-supporting vaults were produced in cooperation with Ochsendorf, Dejong & Block and the Block Research Group at the Swiss Federal Institute of Technology (ETH Zurich), which is led by Philippe Block, member of the Academic Committee of the LafargeHolcim Foundation. Although initially developed as a solution for the Droneport, the construction system is applicable to a wider range of needs – markets, schools and medical facilities, for example. The 2018 Architecture Biennale’s theme of “Freespace” encourages reviewing ways of thinking, new ways of seeing the world, of inventing solutions where architecture provides for the well being and dignity of each citizen of this planet. 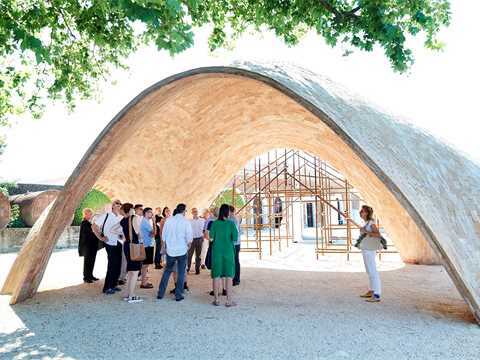 With record visitor numbers of more than 260,000 in 2016 and keen interest again in 2018, the Droneport prototype and its innovative compressed earth bricks from LafargeHolcim will continue to inspire architects and building professionals to pursue innovation in sustainable design. The Golden Lion of the International Architecture Exhibition – La Biennale di Venezia 2018 was awarded to a team of young architects who created the Swiss Pavilion. Their exhibition was curated to encourage debate about the banal interior architecture renters are typically surrounded by in the Western world. Svizzera 240: House Tour was realized by a team of architects from ETH Zurich – a partner university of the LafargeHolcim Foundation. 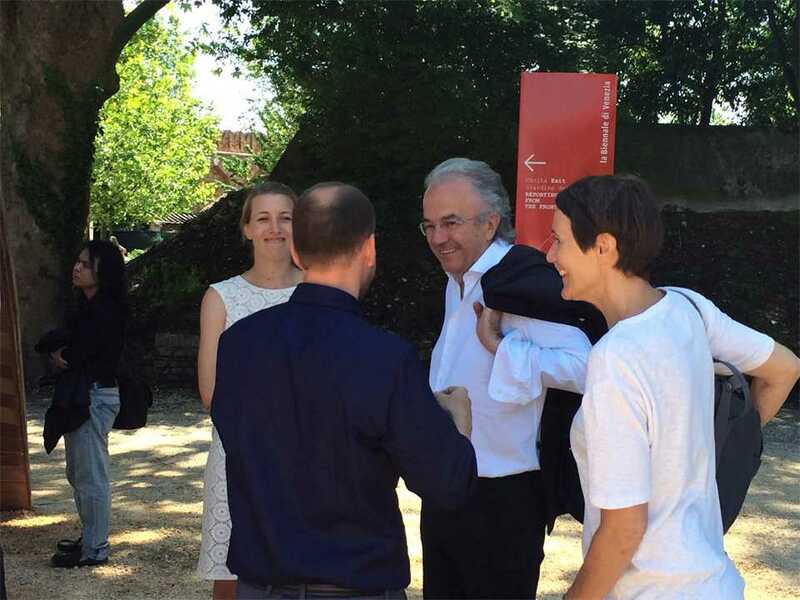 Alessandro Bosshard, Li Tavor, Matthew van der Ploeg and Ani Vihervaara, and the Swiss Arts Council Pro Helvetia, commissioner of the exhibition, received the award at the official opening of the Architecture Biennale. This is the first time that the Swiss Pavilion has received this internationally renowned distinction. Carlos Martín Jiménez working on the Droneport’s construction site in Venice. Construction of the first layer of bricks. 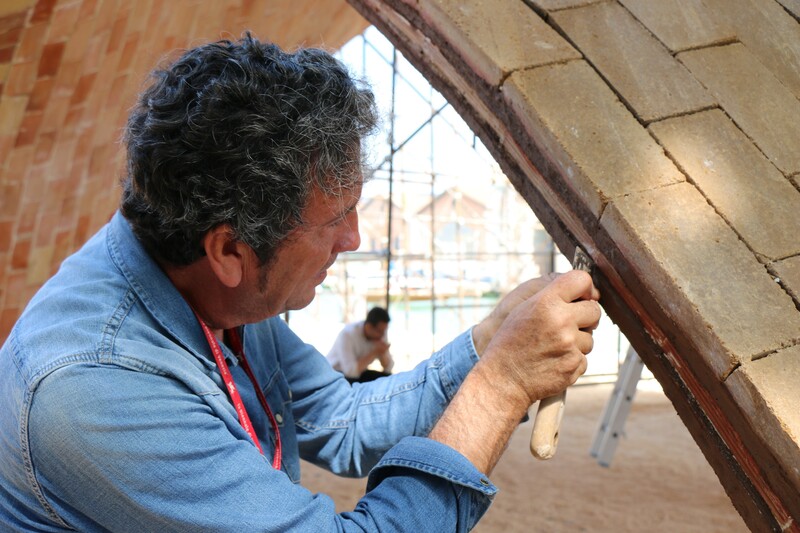 The scion of a family of masons going back several generations, Carlos Martín Jiménez is an expert in the ancient technique of tile-vault construction. He talks about building the first two Droneport prototypes. 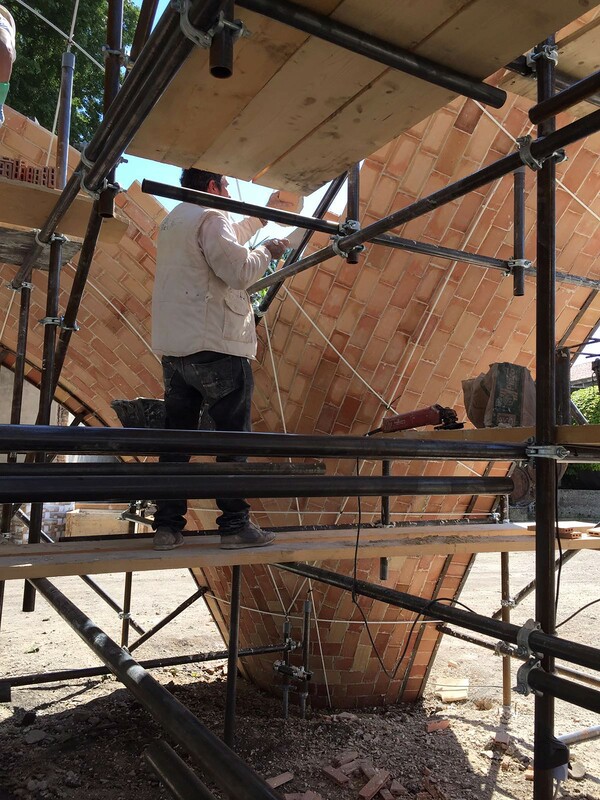 L’Architecture d’Aujourd’hui: Can you describe the tile-vault method of construction? Carlos Martín Jiménez: You need a certain amount of prior knowledge both with respect to the materials and their properties and with respect to geometry. First, you trace the arc of the vault above the space to be covered. Then, you begin to build the springing points, using tile bricks smeared with wet plaster: since the plaster dries fast, the bricks stay in place along the line of the curve you’re following. You need a certain amount of skill and dexterity to follow the curve in space with hardly any formwork. First you build the four ribs, followed by the webbing, in two layers: for the first you use plaster on two edges of the brick, for the second you use plaster on the brick’s face. The two layers need to be correctly laid, either in classic rows or in chevrons. AA: What were the constraints and challenges when building the first Droneport prototype in Madrid using DuraBrics? CMJ: It was very stimulating to work with the architects, the MIT team and the professors and students at the architecture faculty of the Universidad Politécnica in Madrid. The Droneport’s geometry, which differs from that of a traditional vault, was a challenge in itself. But we had a good guide to follow. 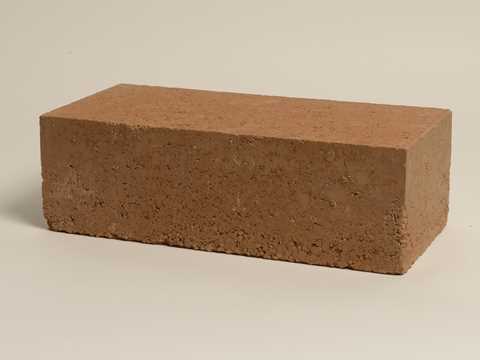 The use of compressed-earth bricks was also new; their properties are different from those of fired bricks, for example the moisture- absorption coefficient, which made it difficult to get the bricks to hold together. The problem was solved through a combination of DuraBrics and ceramic bricks. In Madrid there was a laboratory that helped us work out certain aspects of the prototype. By testing the built prototype, and after looking at videos of its construction, we changed the webbing courses from straight to circular, since that responded better to the actual loading distribution. AA: And what about the Venice prototype? CMJ: The change in scale and the possibility that the vault might be permanent led us to reconsider the adhesive between the DuraBrics. It was difficult to get them to hold in place with plaster, so we had to invent new mortars on site that ensured the cohesion of the vault and its durability. For the same reason, the first layer of the vault was built with traditional fired tiles, and the second two with DuraBrics. AA: Do you think the ambitions of the Droneport project can be met? CMJ: Yes, the project is very interesting, and I believe it is possible to make it work. It needs a few adjustments in light of the lessons learnt in Madrid and Venice. 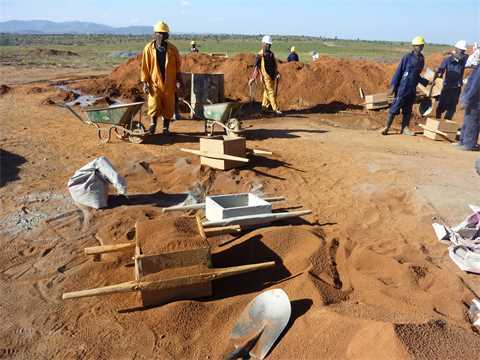 They’ll also have to make sure that the workers who build the Droneport in Rwanda have been properly trained in the construction of tile vaults. DuraBric production doesn’t need wood and has a much lower carbon footprint. Moreover their formal regularity and mechanical resistance are much better than those of handmade kiln-fired bricks. 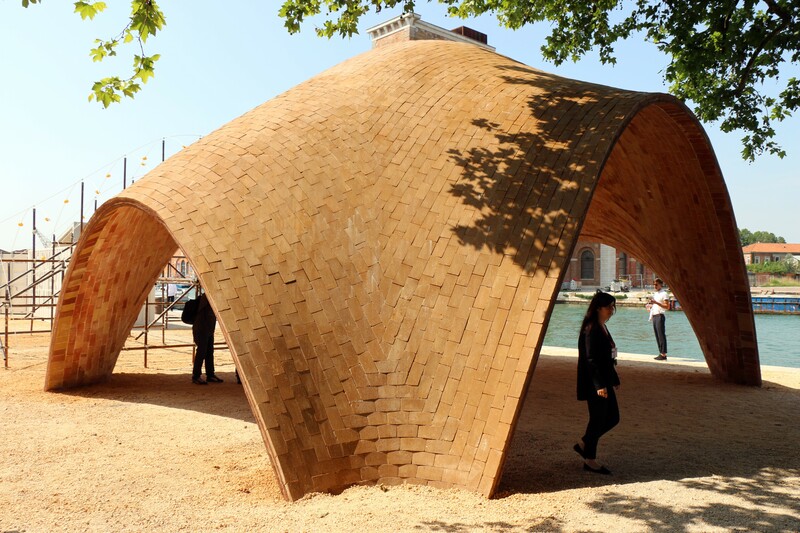 The Droneport is built without formwork, into the air. The DuraBric is made of soil, sand and 5% cement. 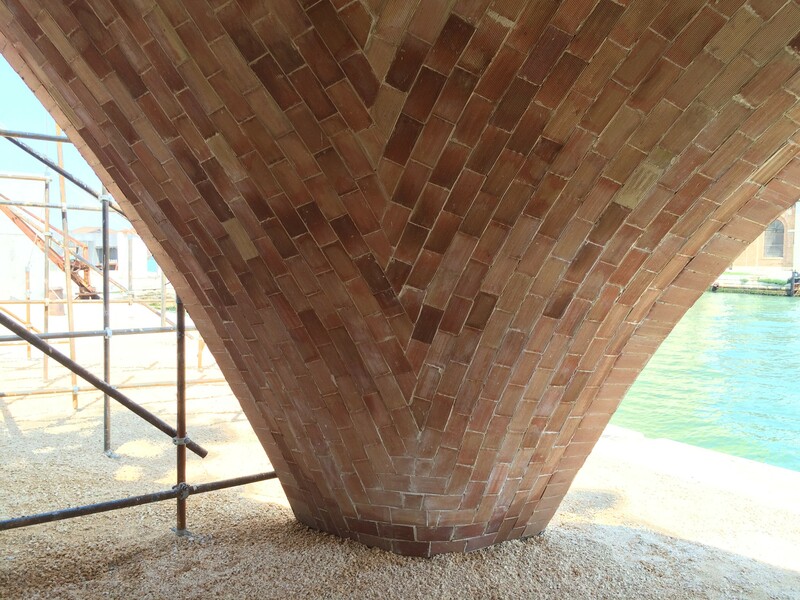 LafargeHolcim has worked on a lighter version of this compressed-earth brick. was responsible for the compressed-earth Durabrics which, combined with traditional fired clay tiles, were used to build the first prototypes. Ivan Serclérat, Technical Support Manager at the LafargeHolcim Research Centre, explains the challenges they faced. L’Architecture d’Aujourd’hui: What were the initial objectives for your compressed-earth DuraBric? Ivan Serclérat: The goal was to develop an affordable and ecological solution. When I say “develop”, we didn’t actually invent anything, it’s a technology that has been around for a long time, particularly in Latin America. We just added a bit more science, and a more global vision thanks to the size of the group and the diversity of its know- how, which allowed us to bring added value to the whole chain of production. We developed the soil analysis so that you can get the right mix, as well as the compression technique, we looked at which were the best production methods, and also optimized the construction system – roofing, foundations, dealing with damp, building design, construction management, etc. AA: Is the technology fully transferable from country to country? IS: Yes. The idea is to have a level of technology that is as light as possible so you can export it, and to adapt the production methods, whether manual or automatic, to the size of the project in question. AA: Soil can vary greatly in composition. How do you carry out a soil analysis? IS: Yes, soil composition changes enormously, even on the same site as you dig down. So we developed very simple tools that can be used on site to see if the soil needs correcting – tools as rudimentary as a sieve and a measuring cylinder. First of all you carry out a granulometric analysis, to see how much sand there is, then a test to estimate the amount of clay – you make soil sausages to check the cohesion of the mix. It’s all very hands-on. Once you know the percentages of sand and clay, you can adjust if necessary. 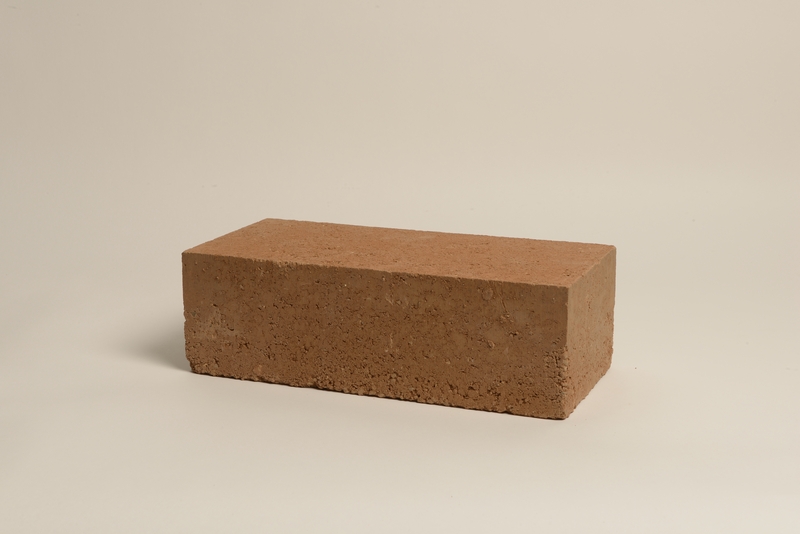 AA: Unlike traditional dried-earth bricks, the DuraBric contains cement. What are its advantages? IS: In many African countries, traditional bricks are fired in wood kilns, which contributes heavily to deforestation. DuraBric production doesn’t need wood and has a much lower carbon footprint. Moreover their formal regularity and mechanical resistance are much better than those of handmade kiln-fired bricks. As for the cement, it only constitutes about 5% of the composition, so as to remain a ordable. The cement makes the DuraBrics more resistant to water than pure earth, reducing the absorption of damp and binding the grains of soil together. AA: What were the challenges when using DuraBrics to build the Droneport? IS: The design consists in a thin vault, whereas the DuraBric was relatively thick and dense, since it was intended for loadbearing masonry walls. DuraBrics are designed to be strong in compression, whereas in the Droneport they must be resistant to bending and need to be pretty slender. When reducing their thickness, the challenge was to obtain sufficient mechanical resistance along their length. We had to re ne our mix so as to optimize the ratio between soil, sand and cement, and adjust the strength of compression. 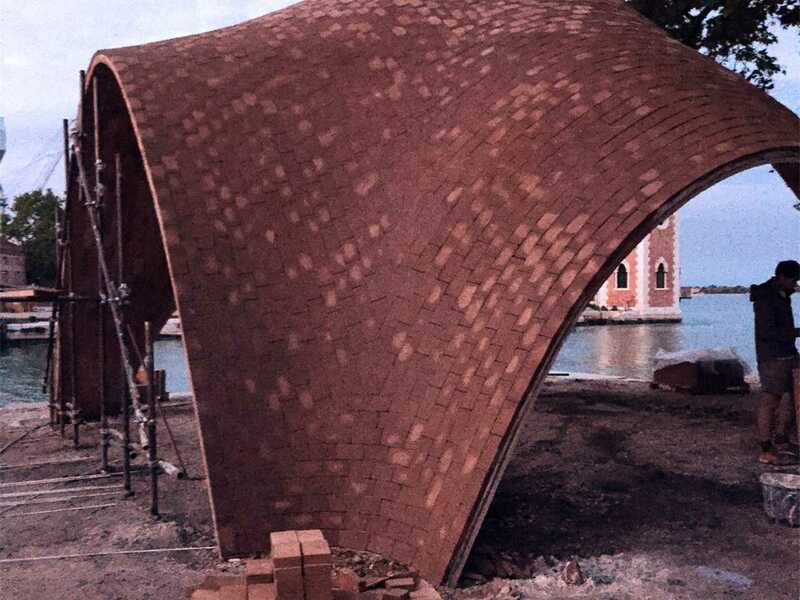 AA: When building the prototypes, you ended up using a mix of DuraBrics and fired clay tiles. IS: The Droneport vault is built without formwork, out into the air, thanks to fast-drying mortar. 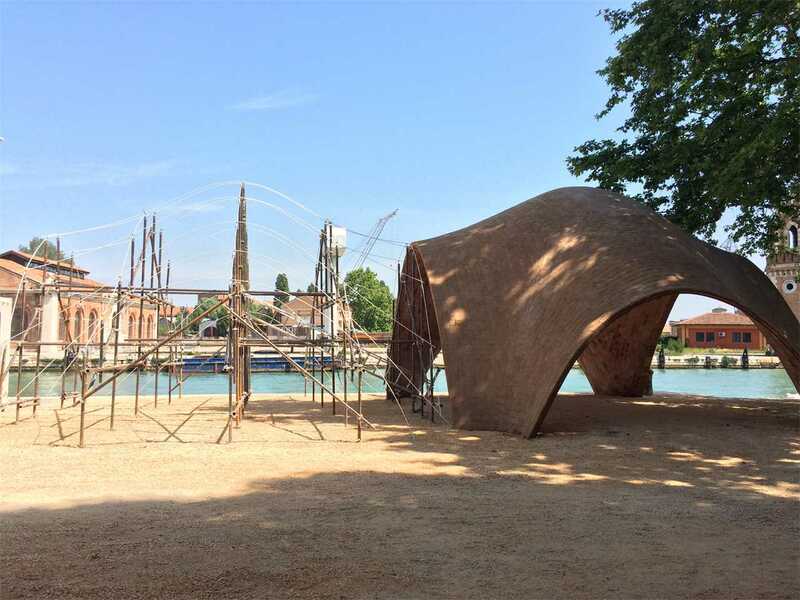 Despite a successful first try-out, in Venice, perhaps because of the mortar used or because of the high level of air humidity, the DuraBrics wouldn’t hold in place. Given the short timescale, we built the first layer in traditional clay tiles, which are lighter, and used DuraBrics for the rest. Since then we’ve developed much lighter DuraBrics, reducing their weight by 30% so that they’re perfectly compatible with the technical requirements of the Droneport vault. Norman Foster’s vision of a Droneport network combines the dynamic futurism of drone technology with low-tech buildings using local materials and 800-year-old building techniques. The network aims to interconnect communities in developing countries that lack appropriate road or rail networks, enabling urgent medical supplies and cargo to be delivered quickly and cost-effectively. The LafargeHolcim Foundation became involved in the project to refine LafargeHolcim’s low-carbon compressed earth Durabric that met the structural requirements using local materials and labor. 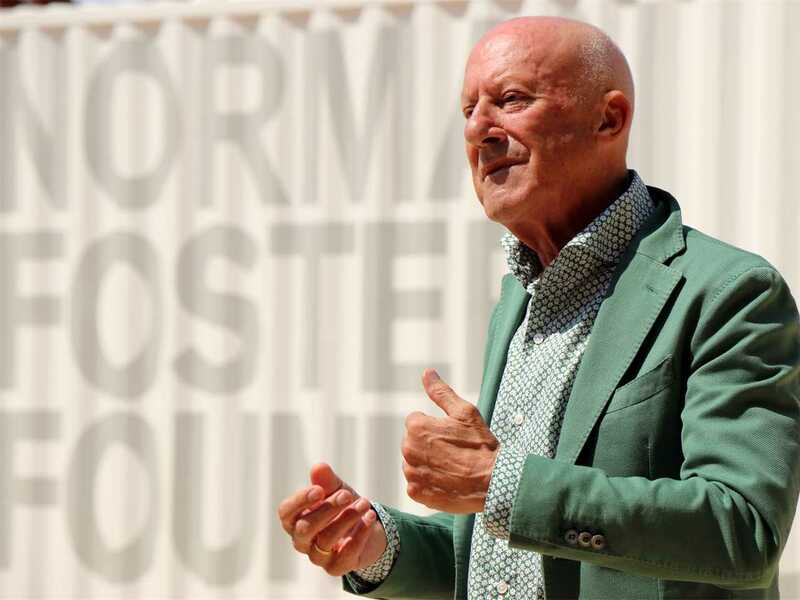 At an event organized by Archizoom, Lord Norman Foster explained the amount of research which went into the Droneport project. 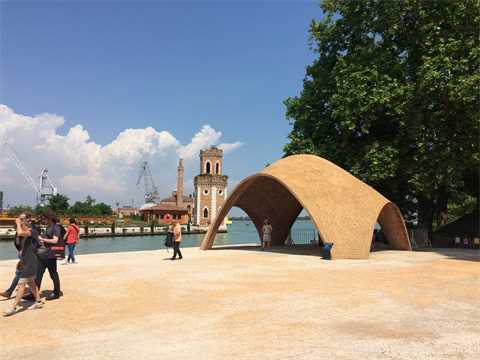 A prototype of the structure is exhibited at the 15th International Architecture Biennale in Venice. The project is a collaboration between the Norman Foster Foundation, five technical universities, the engineering firm ODB, and the LafargeHolcim Research Center in Lyon. 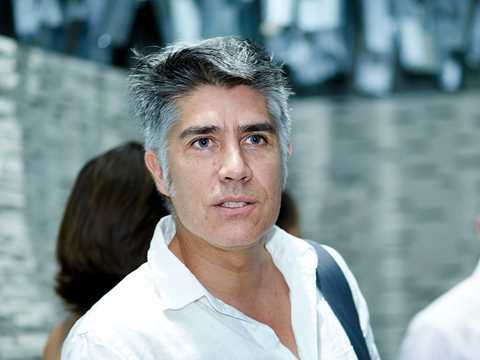 Curator of the 15th International Architecture Biennale, Alejandro Aravena, supports using “a mix of high-tech innovation and low-tech local materials” to reduce carbon emissions related to construction. 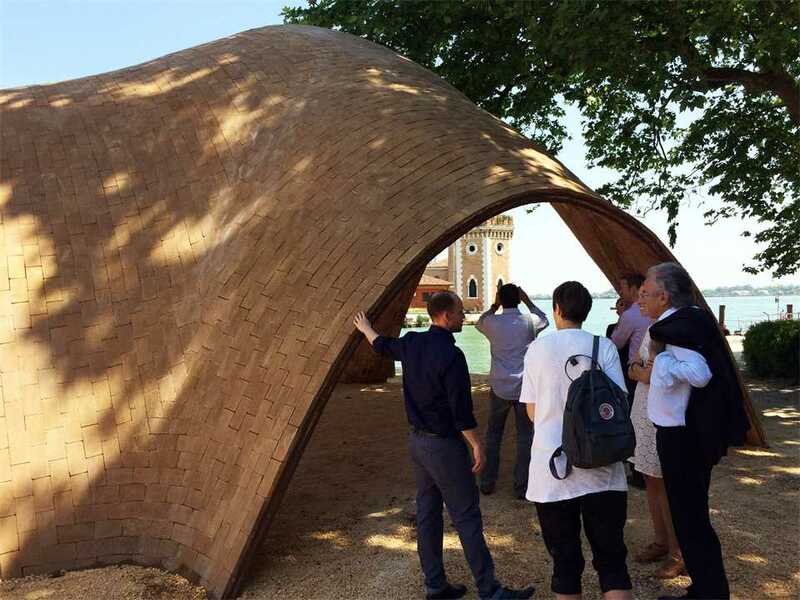 In a video released by the LafargeHolcim Foundation for Sustainable Construction, Aravena points to the Droneport shell prototype at the Venice exhibition as an outstanding example of the pivotal change needed from architecture and industry. 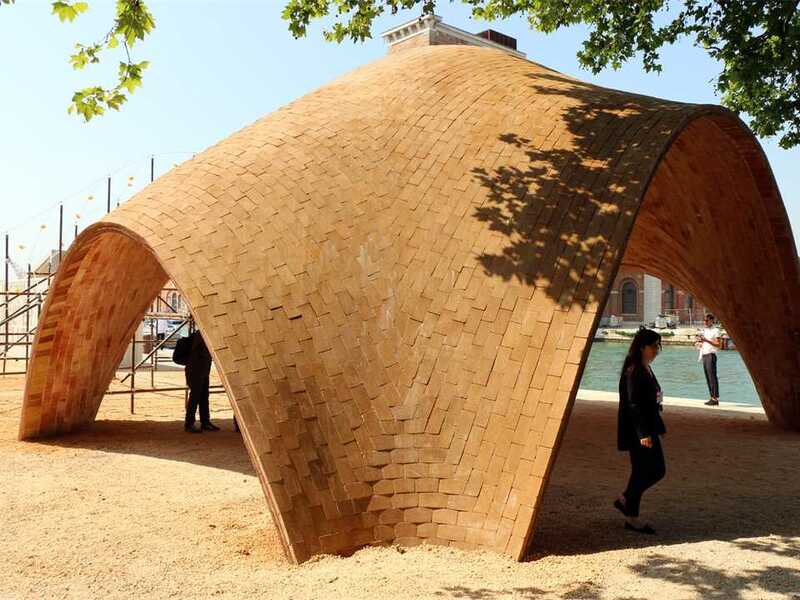 The project combines state-of-the art technology and traditional materials to create a self-supporting structure using compressed-earth bricks. “The construction industry needs to engage with the growing demand for sustainable construction; and have the knowledge and the tools to live up to it” - Alejandro Aravena, Curator of the 15th International Architecture Exhibition of La Biennale di Venezia and Member of the Board of the LafargeHolcim Foundation. The highlight of the guided tour was the visit of the prototype of the Droneport shell at La Arsenale. 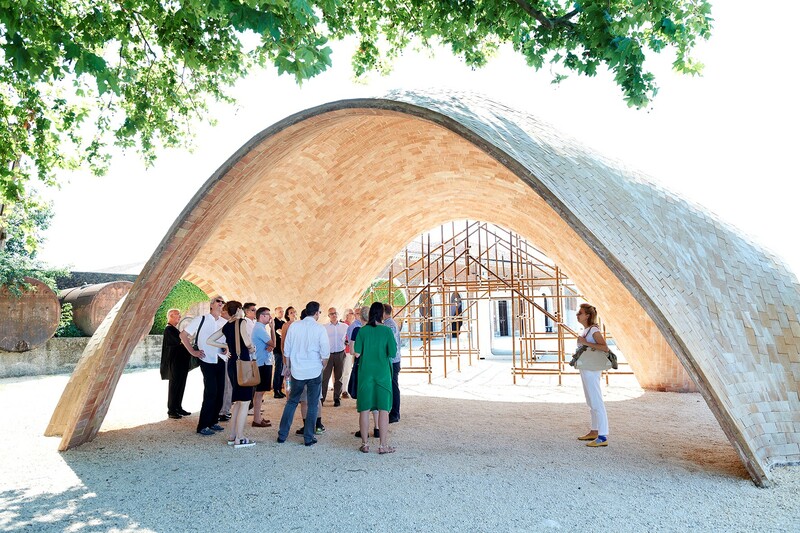 Initiated by The Norman Foster Foundation, the project brought together professors and students from five universities across Europe, the UK and America along with the Swiss LafargeHolcim Foundation for Sustainable Construction and its related Research Center in Lyon. 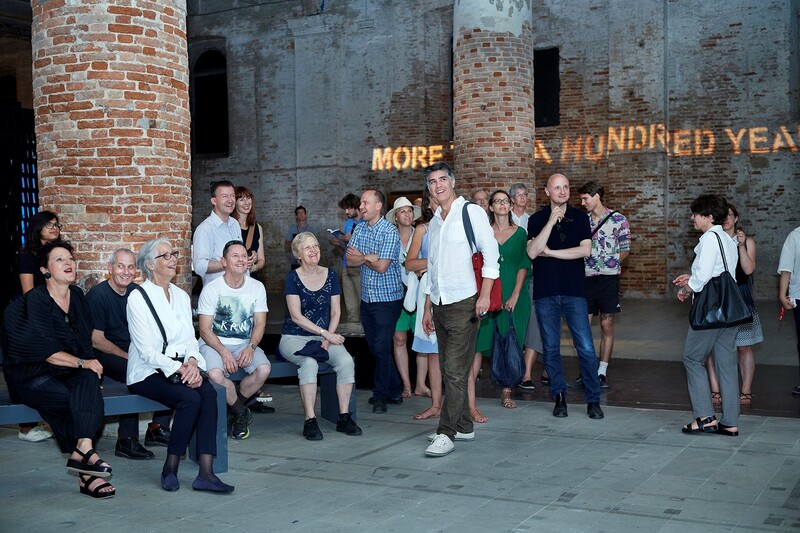 Alejandro Aravena guided his fellow Board members through "his" Biennale in Venice and explained how he approached the topic of "Reporting from the Front". 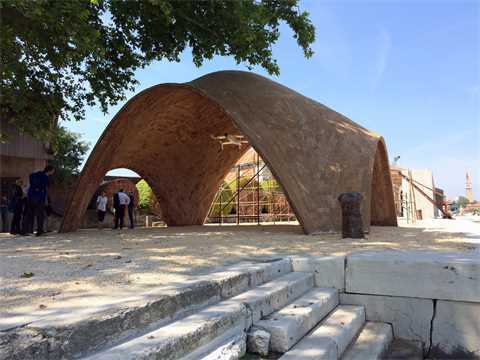 The Research Center of LafargeHolcim in Lyon developed customized bricks to meet the specific requirements of the Droneport vault. The LafargeHolcim Foundation is forging partnerships that promote sustainable construction and life cycle thinking along the value chain from design through to implementation. 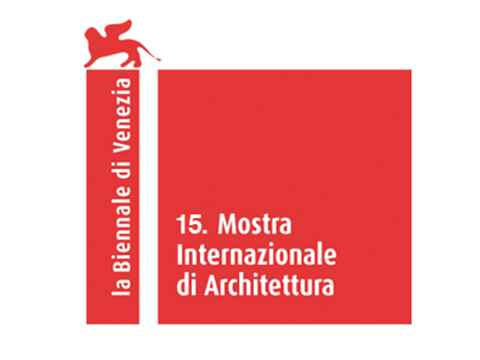 The Foundation’s approach of learning from outstanding examples is aligned with the International Architecture Biennale – the most important exhibition of its kind, which attracts thousands of the world’s most influential architects, designers, urban planners, developers and critics. 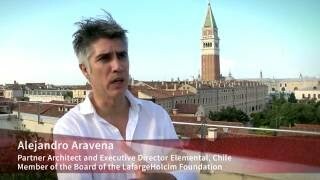 One of the main goals of the Biennale “Reporting from the Front” is to share practical ideas because “learning in architecture comes very much from examples”, says Aravena (video, right). The Biennale strives to bring together technical innovation (“crucial because in the end it’s about ideas being translated into reality”) and creativity to show means and ways to improve the quality of life in the built environment. 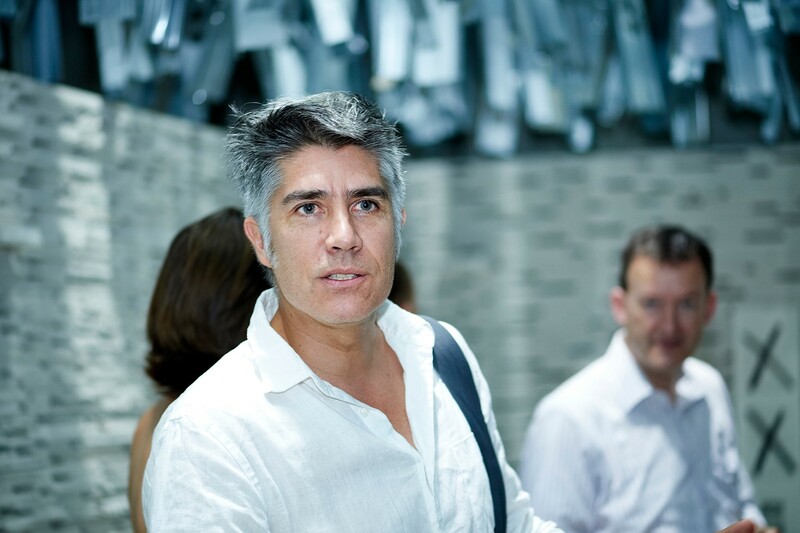 “The construction industry needs to engage with the growing demand for sustainable construction; and have the knowledge and the tools to live up to it”, adds Aravena, winner of the Pritzker “Nobel Prize” for Architecture. “We must realize that our business is full of constraints, we need to be very clear about what is possible and what is not”. For Aravena, this is the trigger for creativity and emphatically requires a closer collaboration between designers, engineers and the construction materials industry to “move ahead and make a change”. 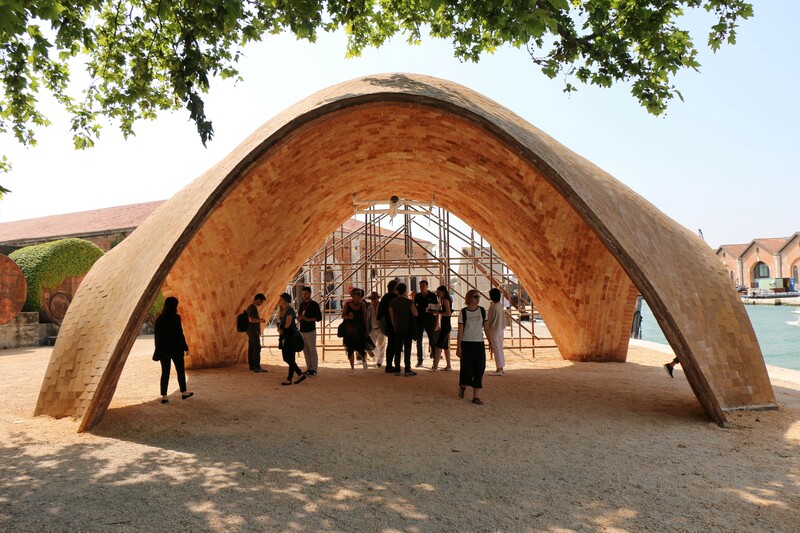 This “change-making” mindset is exemplified by the Droneport project (video, right) at the Architecture Biennale that was initiated by The Norman Foster Foundation. 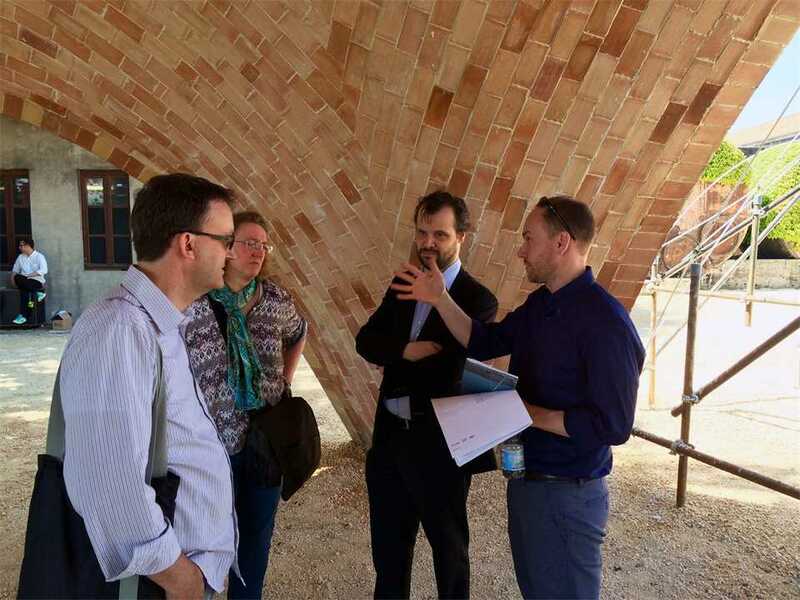 The project brought together professors and students from five universities across Europe and the US along with the LafargeHolcim Foundation for Sustainable Construction and the LafargeHolcim Research Center in Lyon. Based on the requirements of the design by Lord Norman Foster (video, below right) and the engineers of Ochsendorf DeJong & Block (ODB), the Lyon Research Centre optimized the mix of earth-based Durabric for the project. 18,000 customized bricks were produced for the Droneport shell in cooperation with the Block Research Group at ETH Zurich. The challenge was to ensure a compressive strength of at least 10MPa whilst minimizing the weight and thickness of each tile. Although initially developed as a solution for the Droneport, the construction system is applicable to a wider range of needs – markets, schools and medical facilities, for example. Durabric is made of stabilized earth – a reliable, affordable and environmentally friendly building material, particularly suitable in emerging countries. LafargeHolcim initiated commercial production of the naturally cured building block that uses locally sourced compressed earth and achieves impressive structural strength through the addition of cement. LafargeHolcim recently launched “14Trees” to support the use of Durabric for affordable housing projects – a joint venture with CDC, the UK’s development finance institution. The “Droneport” vault construction at the Norman Foster Foundation Pavilion using “Durabric” compressed earth tiles developed by LafargeHolcim. 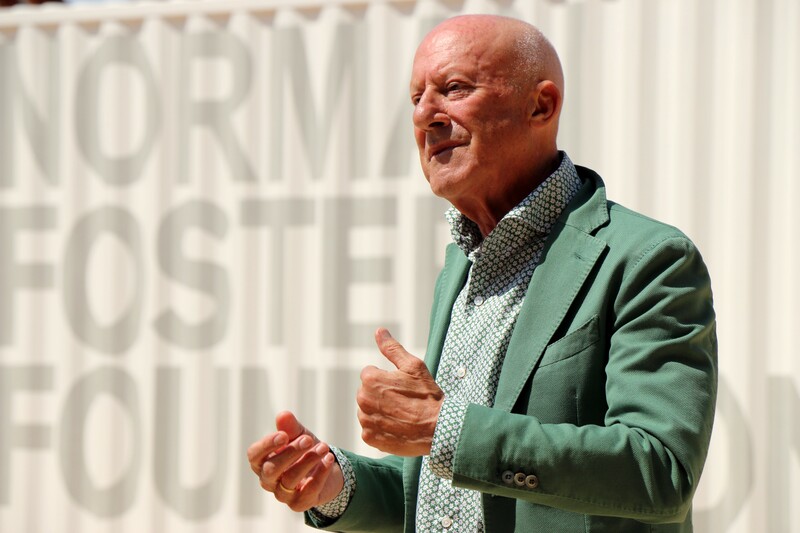 Norman Foster pictured at the opening of the Droneport exhibition. 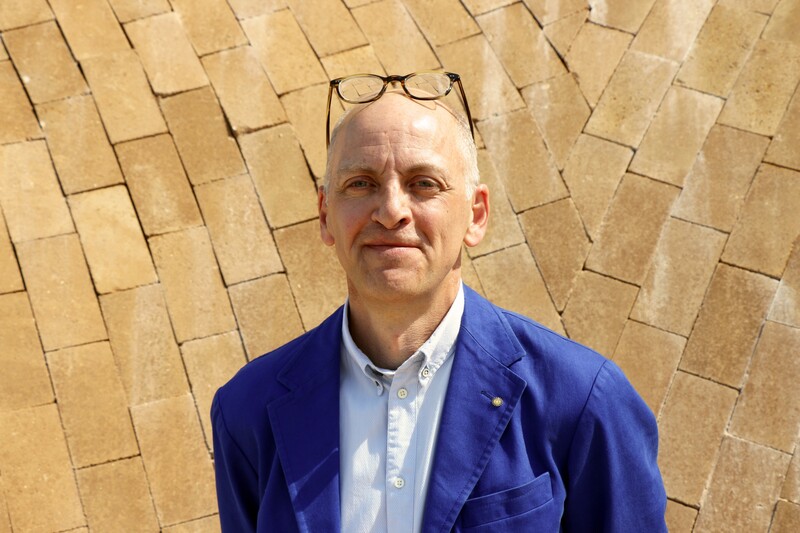 His vision of a Droneport network combines the dynamic futurism of drone technology with low-tech buildings using local materials and 800-year-old building techniques. Droneport introductory display: the project brought together professors and students from five universities across Europe, the UK and America along with the Swiss LafargeHolcim Foundation for Sustainable Construction and its related Research Center in Lyon. The prototype vault comprises two outer layers of this custom “Durabric” with an inner layer of traditional tiles from Valencia. The special product is of stabilized earth – a reliable, affordable and environmentally friendly building material. 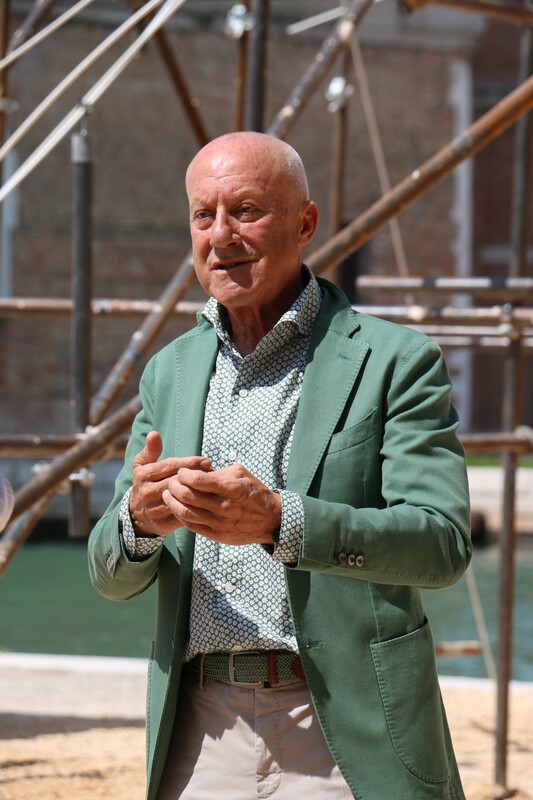 Norman Foster at the media conference launching the Droneport pavilion at the 15th International Architecture Biennale in Venice. Media conference at the launch of the Droneport pavilion at the 15th International Architecture Biennale in Venice with Norman Foster, Norman Foster Foundation (left, back to camera) and Jonathan Ledgard, Future Africa EPFL, (right, back to camera) introducing their project and explaining the significance of the prototype structure exhibited at the Biennale. The creation of a pavilion at the 15th International Architecture Biennale in Venice based on a typical bay of the “Droneport” was made possible by The Norman Foster Foundation. The project brought together professors and students from five universities across Europe, the UK and America along with the Swiss LafargeHolcim Foundation for Sustainable Construction and its related Research Center in Lyon. 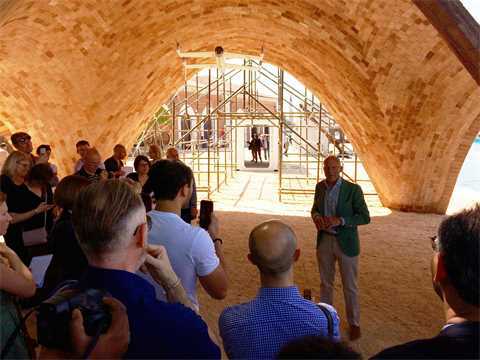 Although initially a response to the “Droneport”, the construction system is applicable to a wider range of needs: markets, schools and medical facilities for example. Its location at the end of the Arsenale in Venice is symbolic as the gateway to a newly opened public park. The possibility of the structure remaining as a permanent legacy is now under consideration. The coloration of the earth-based “Durabric” products, which were specifically made for the project, is a careful match with the historic buildings which surround it. The project has been realized by The Norman Foster Foundation on a very tight timescale, six months overall, four weeks on site – made possible by the close links between the engineer partners of ODB and their universities: John Ochsendorf, MIT; Matthew DeJong, Cambridge; and Phillippe Block with his research group at ETH Zurich. 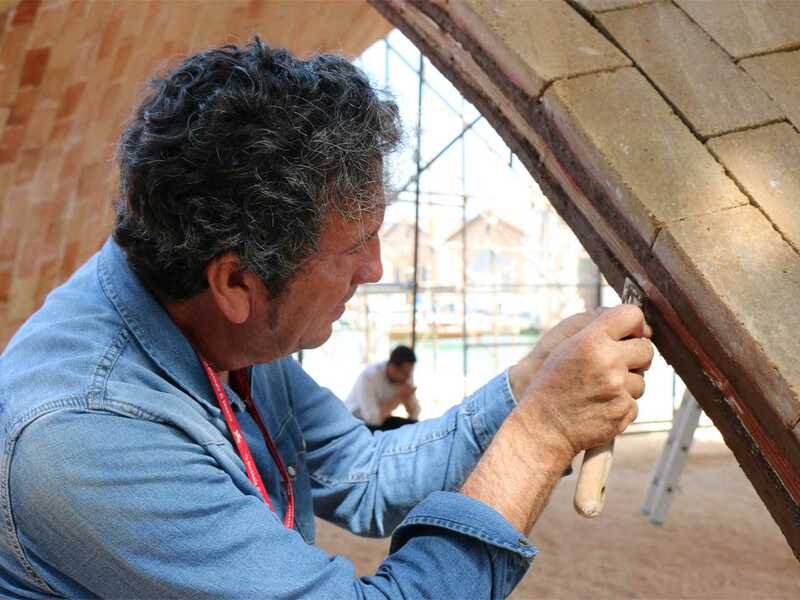 An interim feasibility study involved the construction of a half-size vault at the Polytechnic University of Madrid headed up by Santiago Huerta. The Spanish construction team moved on to Venice to create the present pavilion. 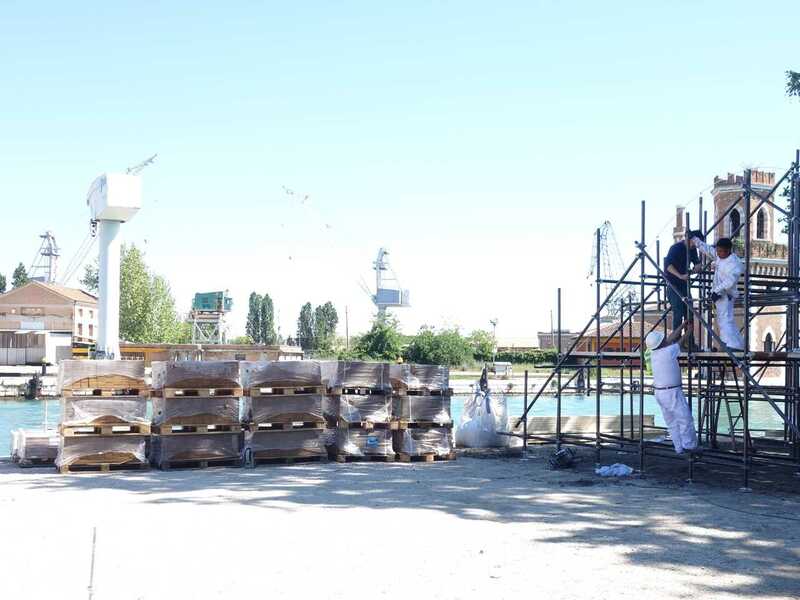 The Madrid exercise enabled the Research Center of LafargeHolcim in Lyon to optimize the mix of a specially developed “Durabric” earth-based product for the project. 18,000 customized bricks have been produced for the Droneport shell in Venice in cooperation with the Block Research Group at ETH in Zurich and MecoConcept in Toulouse. The challenge was to ensure a compressive strength of at least 10 MPa whilst minimizing the weight and size of each brick. The prototype vault comprises two outer layers of this custom “Durabric” with an inner layer of traditional tiles from Valencia. The special product is of stabilized earth – a reliable, affordable and environmentally friendly building material. 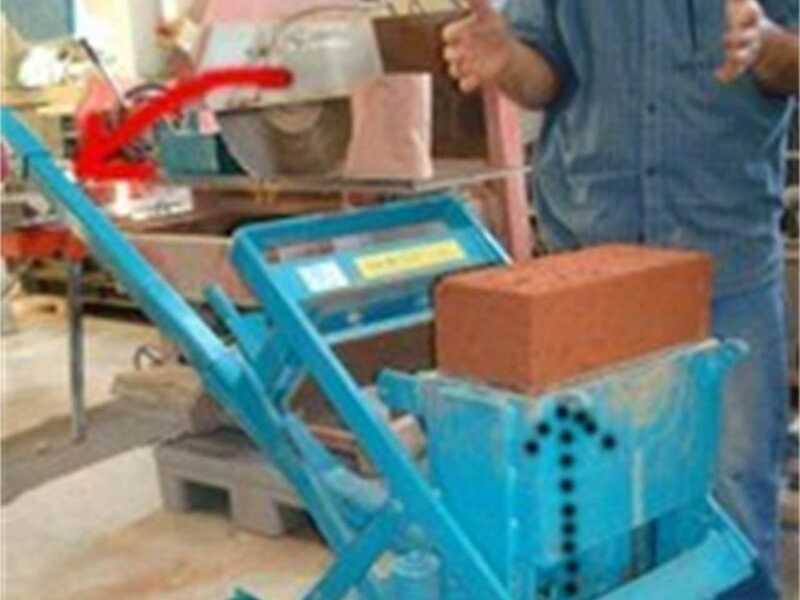 Compared to burnt clay bricks, they do not require intensive use of fuel to achieve their performance. LafargeHolcim has launched commercial production of the naturally cured building block made of locally sourced compressed earth and cement termed ”Durabric” in various emerging countries. The collaboration to showcase the transferability of the approach, and the environmental, economic and social advantages of “Durabric” was initiated by the LafargeHolcim Foundation for Sustainable Construction – also known for its international Awards competitions. LafargeHolcim and CDC Group, the UK’s development finance institution, created 14Trees, a joint-venture that aims to accelerate the production and commercialization of Durabric. The artist Olafur Elliason has been exploring the potential of solar powered mini lamps (Little Sun) for communities without access to an electricity network. 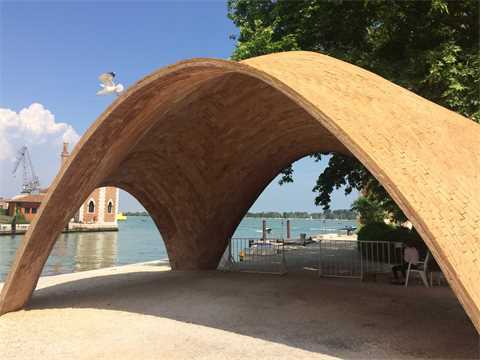 In Venice this concept has been integrated into the pavilion display to show the possibilities, longer term, to incorporate energy harvesting into the building fabric. This development led to the idea of an element called “Solarbrick”, which could be incorporated into the structure of the vaults. Solar cells on the exterior surface would charge a long-life battery in the body of the brick to power LEDs on the internal face with switching by a remote appliance. Structure, energy and lighting are thus integrated into a single component. The “Droneport” project is a convergence of building and drone technologies to address shortfalls in the infrastructure of emerging economies. For example, the drone is capable of delivering cargo and urgent medical supplies quickly and cheaply on continents lacking adequate road and railway systems. A proposed drone network would bypass these deficiencies. It would be punctuated by mini airports or “Droneports” which would also serve wider needs such as health centers and markets. As Jonathan Ledgard put it: “It is inevitable, on a crowded planet with limited resources, that we will make more intensive use of the lower sky to deliver precious goods more cheaply, swiftly and accurately than ever before. Then futuristic craft will benefit poorer countries held back by lack of roads.” The “Redline” approach will differentiate it significantly from existing drone development which is focused on military missions or last-mile consumer delivery applications for affluent communities. From the outset the “Droneport” was seen as a catalyst to promote a wider range of activities. It could create commercial locations as well as integrating the local supply chain in the drone economy. Government could also be assisted to leverage frontier technology and transition farming communities into service and education initiatives. The development of the cargo drone element of the project seeks to combine the capability of vertical take-off and landing with the economy of soaring like a sailplane. The design started with Lorenz Meier at ETH Zurich and has since been extended out to an Airbus team at Bristol in the UK. Jonathan Ledgard approached Norman Foster with the “Redline” concept because of his combination of airport design experience and knowledge of flight as a pilot of sailplanes, helicopters and aircraft. Foster then shared the challenge with his colleagues Narinder Sagoo and Roger Ridsdill Smith at Foster + Partners. Working with their teams the basis of a modular vaulted system evolved. 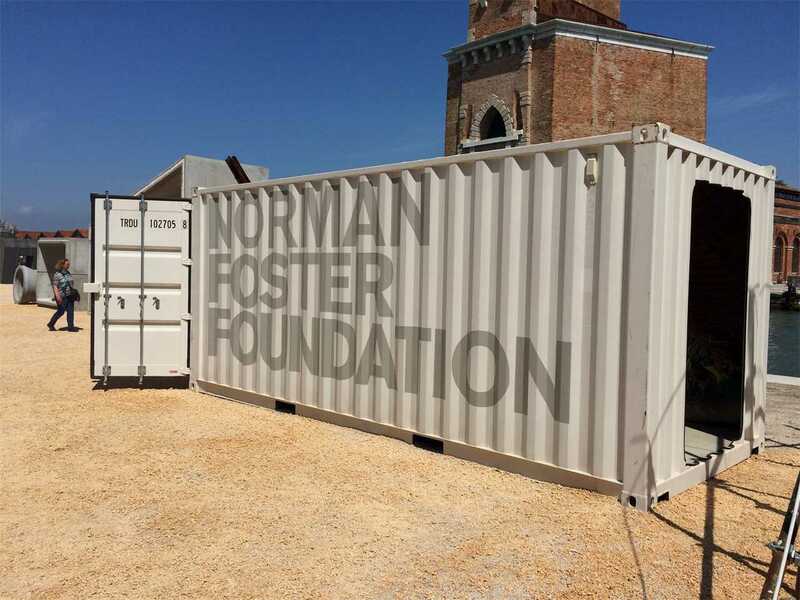 It has fallen to The Norman Foster Foundation to advance it beyond early feasibility stage and has led to the present team to design, engineer and implement the project through to a built reality. In the context of the 15th International Architecture Biennale in Venice, the architecture museum Archizoom of the Swiss Federal Institute of Technology in Lausanne (EPFL) organized a discussion event dedicated to "Sky over Horizontal Metropolis - Conversation on the Redline project, droneports in Africa". 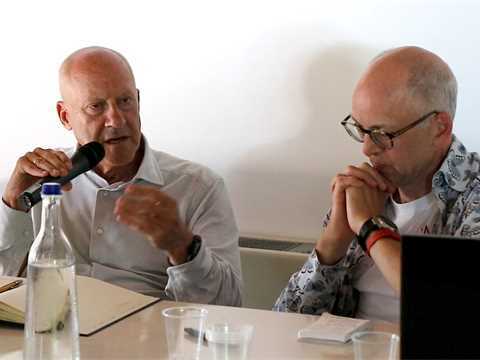 The initiators of the Droneport, Lord Norman Foster and Jonathan Ledgard, informed the audience on the development and the complex collaboration with the partners who provided the research, including five technical universities, the engineering firm ODB, and the LafargeHolcim Research Center. 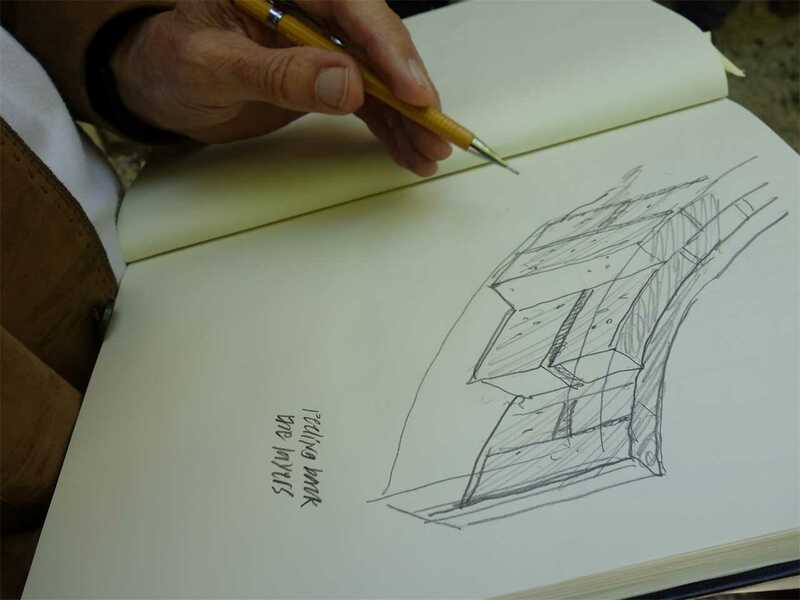 Sketch by Lord Norman Foster showing the Durabric sandwich construction used to build the Droneport prototype. Durabric fabrication: LafargeHolcim developed Durabric, a naturally cured building block made of compressed earth and cement, and launched it commercially in Cameroon, Indonesia, Malawi and Tanzania. 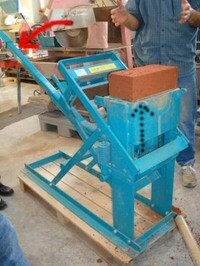 Stabilized earth bricks are a reliable, affordable and environmental-friendly building material. Compared to burnt clay bricks they do not require the intensive use of firewood or other fuel to achieve their performance. LafargeHolcim developed Durabric, a naturally cured building block made of compressed earth and cement, and launched it commercially in Cameroon, Indonesia, Malawi and Tanzania. 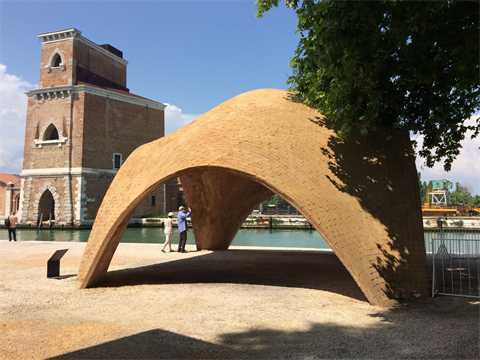 As the technology is easily transferable, the LafargeHolcim Foundation for Sustainable Construction encouraged the use of Durabric to build the Droneport prototype at the Architecture Biennale in Venice as a symbol for future projects in Rwanda and other emerging countries. 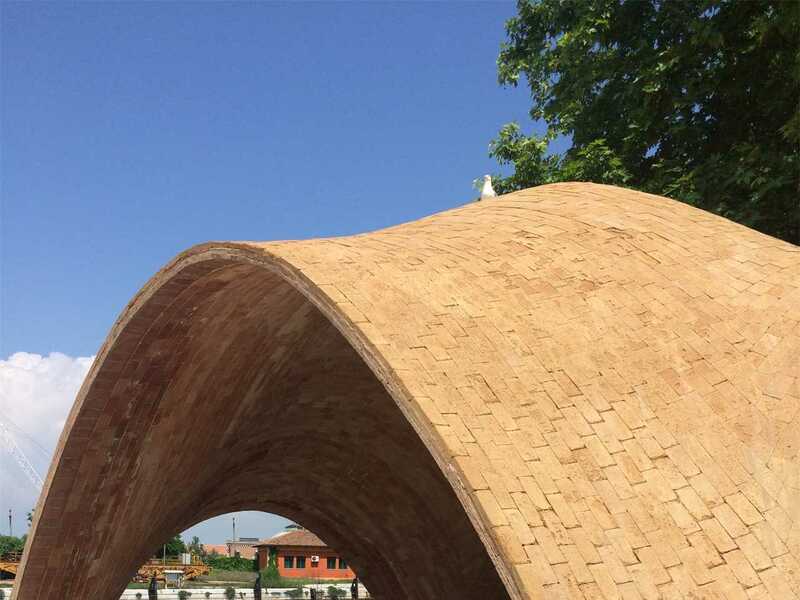 The Research Center of LafargeHolcim in Lyon developed customized bricks to meet the specific requirements of the Droneport vault. The challenge was to ensure a compressive strength of at least 10 MPa while minimizing the weight and size of each brick. The mix design was optimized in close cooperation with the Block Research Group at ETH Zurich and MecoConcept Toulouse. 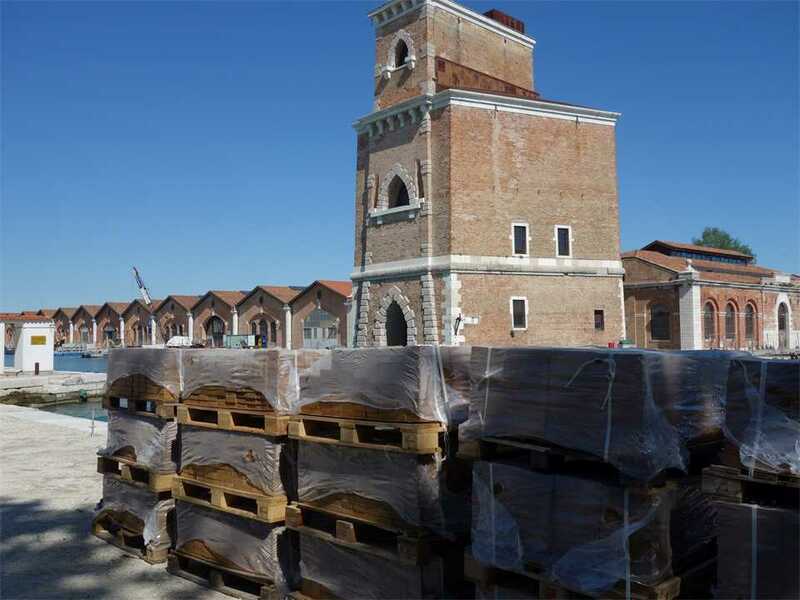 18,000 Durabrics were made available for the Droneport construction in Venice. 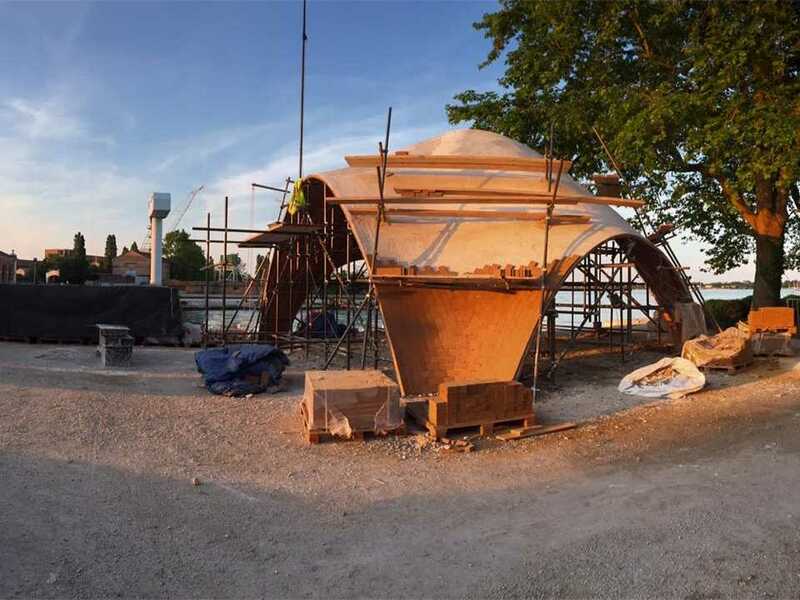 The heavy exposure to rain of the outer layer inspired LafargeHolcim to adapt the receipt of the waterproofing agent that is applied on the Droneport. It is almost a rule that one necessary step towards development is the implementation of infrastructure — roads, ports, airports, and railways are meant to provide the connectivity to move goods, services, and people. There are many places in Africa that lack appropriate infrastructure, and it may take a while to put it in place. The proposal for a Droneport is expected to provide one step towards development; using the air to move things on a small scale may be a shortcut that will ultimately save time and money without having to wait for heavy, conventional infrastructure. It is the equivalent of the old telephone line compared to the cellular network. Drones delivering medicine, food, or a missing piece to repair a car or water mill could be called a kind of cellular infrastructure. Such a network has to have ports, and Norman Foster explored the idea of a port architecture that is modular (as many bays as are needed), local materials (compressed clay or mud bricks), can be used for many other programs (market, community center, covered square). Such are the choice in order to make the building really serve the community over time. Foster combines state-of-the-art engineering that can be built by almost everybody. He actually involved students in the construction, not as a pedagogical or academic statement but as a way to test the proposal’s transferability. 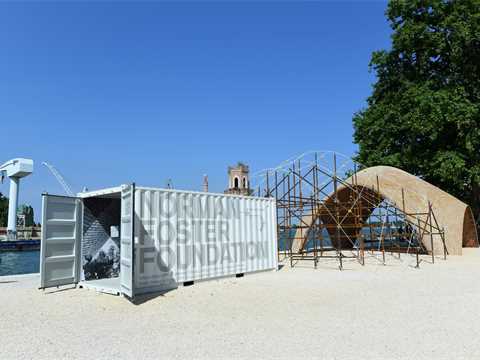 In the end, each module will be compressed to a package of materials and procedures that will be sent to remote places and will have to be built by a registration of the building process during the Biennale is meant to work as a kind of tutorial for the future. In this sense, the prototype is not only an object but a procedure as well. LafargeHolcim and CDC Group, the UK’s development finance institution, created 14Trees, a joint-venture that aims to accelerate the production and commercialization of Durabric.